Heather Wallace, The Timid Rider, may lack confidence in the saddle but she found inspiration attending The Gobi Desert Cup, an endurance horse race traversing six days and 300 miles on Mongolian horses from August 22-31, 2018. Heather documented and photographed 18 riders as they learned Mongolian horsemanship, experienced nomadic culture, and raced over varying terrains. Secluded from the rest of the world for ten days, Heather documented and photographed 18 international riders as they learned Mongolian horsemanship, experienced the nomadic culture and raced over varying terrains. While immersed in Mongol culture and learning their equestrian traditions, Heather followed the journey of these riders on course and off, working closely with FEI 3* and 4* veterinarians and other ride officials. For the second year in a row, all horses and riders completed the race without injury. 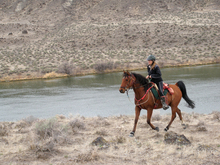 More than a race, Heather lived the nomadic lifestyle, stepping entirely out of her comfort zone to learn more about the long-standing traditions of local nomads, who returned for the second year in a row to work with the event organizers and provide 130 conditioned and trained horses. While following the riders on course by truck, Heather was inspired to overcome her fears and get back in the saddle, timid or not. The officials held a race of their own on the last day, much to the riders’ entertainment. Despite her initial panic, she rode a Mongolian horse at full gallop to compete against the rest of her team, spurred on by the cheers of the international riders and the herdsmen alike, proving that passion can indeed be greater than fear. Heather Wallace is a Certified Equine Sports Massage Therapist (ESMT), Certified Canine Massage Therapist (CCMT), and Aromatherapist working diligently to reveal to the world the benefits natural therapies for animals through both hands-on work and writing in her award-winning blog, The Timid Rider. Heather is a writer for many publications including Equine Info Exchange, Sidelines Magazine, and Holistic Horse Magazine. Her first book, Equestrian Handbook of Excuses, was a 2017 Literary Selection for the Equus Film Festival. Available now is her bestselling book, Confessions of a Timid Rider, which details her insights about being an anxiety-ridden but passionate equestrian. Follow her on social media @timidrider and at timidrider.com. 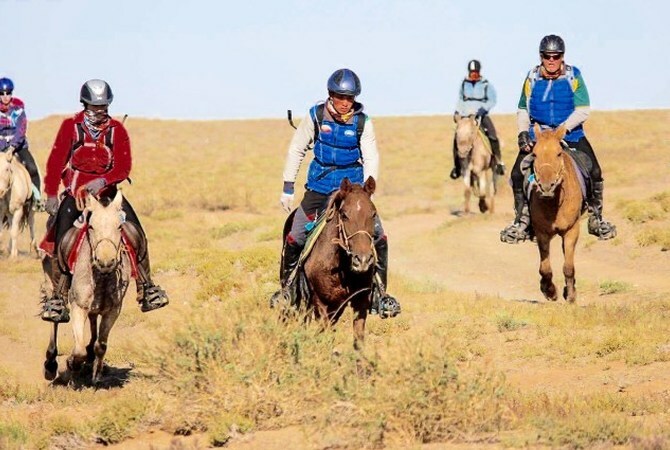 Co-founded in 2016 by FEI 3* Endurance Rider, Camille Champagne, and leading Mongolian veterinarian Naranbaatar Adiya, the Gobi Desert Cup is a 480-kilometer multi-stage endurance race through the Gobi Desert, riding Mongolian horses every day for six days over 50 miles. This challenge is the only one of its kind to combine endurance while positively supporting Mongolian culture and their horses. 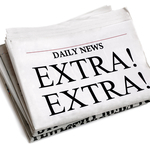 Visit gobidesertcup.com for more information or to apply for 2019.